If you or someone you care about has recently received a prescription for oxygen therapy, you’ve probably realized there’s a lot to learn. New technologies for concentrating and delivering supplemental oxygen now allow more freedom of movement than ever before, but it’s helpful to master a few basic concepts before choosing an oxygen system. Complete the form to the right to receive your FREE Oxygen Therapy Guide today! 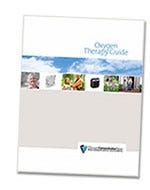 Complete this form to download the FREE Oxygen Therapy Guide. Please provide us with some basic information to receive the guide.